BYU got things started yesterday with a sweep of West Virginia, and improved to 2-0 in the tournament with a crazy upset of top-ranked Stanford. That means Wichita State will try to go for the win at the tournament if they can upend BYU, while the Cardinal could still earn a three-way tie if the Shockers beat the Cougars but Stanford downs WSU. After falling behind 1-0, (RV) Wichita State was able to come back and progressively look stronger in a four set victory over West Virginia. The Mountaineers built their lead and held a huge advantage with blocks at 13-5 in terms of team blocks. That combined with the offense of Kristin Lux (14 kills, .167, 8 digs), Katelyn Evans (12 kills, .182) and Natania Levak (10 kills, .296) to put West Virginia in front and keep them close in the second. Things turned though, as Alex Koon (15 kills, .438, 16 digs) was fantastic for Wichita State on both ends of the floor, even logging a new career-high for digs. Tabitha Brown (11 kills, .176, 7 digs) and Megan Talfinger (11 kills, .179, 5 digs) each added strong totals as well, while Emma Wright (8 kills, .313) brought more efficiency. Wichita State wound up with more kills (56-48), aces (4-3), assists (52-47) and digs (57-56). They also hit more efficiently at .224 to .191 – with WVU’s mark sitting at just below .120 in the final three sets. Next up, West Virginia faces Stanford tomorrow night while Wichita State also takes on the Cardinal, just in the morning, before they match up with BYU in a road contest against a top 10 opponent. This may have been an early regular season match, but the Cougars proved that they are around to stay near the upper echelon of teams in college volleyball for 2018. 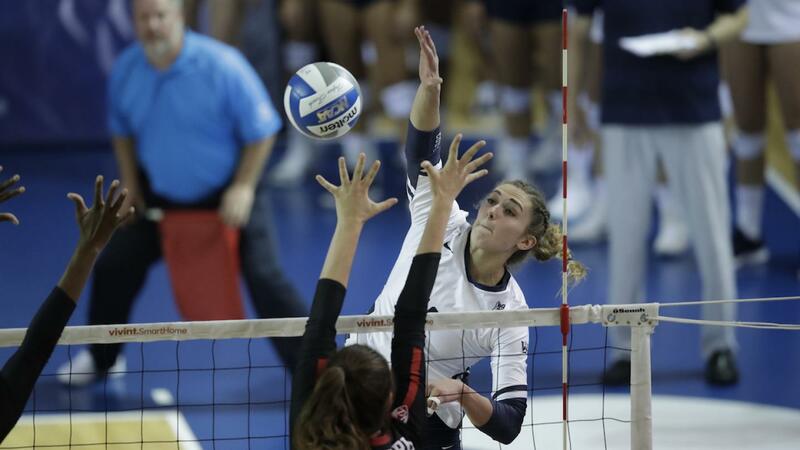 That almost fell a bit to the wayside as the 2016 champs nearly engineered a reverse sweep of the Cougars, but behind the home crowd BYU held off the charge to win in five. The Cardinal were riddled with errors early and just didn’t look totally comfortable to start. That theme would persist throughout, as Stanford posted 31 attack errors (bogging down their hitting percentage to .203 despite a .394 fourth set), 11 more serve errors and a five additional block errors. If you total those three error categories up for BYU, you come up with 13 less errors. That could be conceived as the difference, along with a dynamic Cougars attack that hit .234 – but .233 in the first, .310 in the second and .333 in the fifth. Throughout the team back-and-forth that was eventually won by BYU in the decisive fifth, a battle of two of the top pin players in the country went on as well. Kathryn Plummer (21 kills, .176, 4 blocks, 4 digs) picked things up as the match went on but wasn’t as effective at times when Stanford’s passing fell off. Roni Jones-Perry (20 kills, .341, 10 digs, 5 blocks, 2 aces) hit the 20-kill plateau as well with some floor crushing shots to go with a player of the year type of performance overall. Beyond the pins, there was also a battle of stud liberos that was won by BYU, who avoided Morgan Hentz (14 digs) at times but also saw Mary Lake (18 digs) put up a strong defensive performance. Also pitching in for BYU at a high-level were McKenna Miller (15 kills, .154, 2 blocks), Heather Gneiting (9 kills, .167, 10 blocks), Kennedy Eschenberg (7 kills, .385, 3 blocks) and setter Lyndie Haddock-Eppich (48 assists, 7 digs, 5 blocks). For Stanford, Audriana Fitzmorris (13 kills, .385, 4 blocks) continued to prove effective as a pin while Meghan McClure (12 kills, .176, 12 digs, 4 blocks), Tami Alade (8 kills, .235, 8 blocks), Holly Campbell (7 kills, .111, 6 blocks) and Jenna Gray (53 assists, 6 digs, 4 blocks) showed many bright flashes but were inconsistent throughout. Amazingly, BYU also did this without Taylen Ballard – who is still working back from injury and figures to slide in on the right side so that the Cougars have a bit more size at the net. This match has huge ripple effects toward both the rankings and end of the year. In terms of the latter, it now gives BYU – as long as they take care of business in the WCC and in non-con (even more so if they beat USC) – a legit shot at a top four overall seed for the NCAA Tournament. Stanford will have plenty more chances to make up for this in the Pac-12 and non-conference, so a five-set road loss to a really good team won’t be a killer, but it’s proof that they aren’t the runaway favorite this season. To round the weekend out, Stanford will now take on (RV) Wichita State tomorrow morning in a tough reset after this one followed by West Virginia on Saturday night. BYU meanwhile gets Wichita State as well, just at night for the encore.